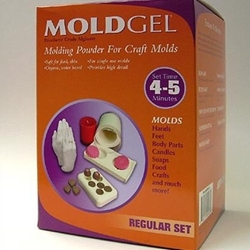 Mold Gel is organic, water based molding powder made from sea grown kelp (alginate). It is used for making single-use molds of body parts including child and adult hands and feet, candles, food, soap, and craft molds. Sets to a firm, rubbery consistency, providing high detail down to finger prints when cast. Features include: Skin safe; Food safe; Safe for fast set resins; Superior detail; Water based; Warm water mix; Creamy consistency; Tear resistant; Gradual setting (sets in 4-5 minutes). The box contains one pound of Mold Gel molding powder.